Maggie is certain that her mare, Bourbon Belle, can take the top purse in the inaugural Peyton Stakes, the richest race ever run in America. Maggie only needs the chance to prove it. To give her that chance, and to save Linden Downs from being sold to the highest bidder, Maggie's father-aging, yet wily as ever-makes a barter. His agreement includes one tiny, troublesome detail: that Maggie must marry a man she's never met. A man she never would have chosen for herself. 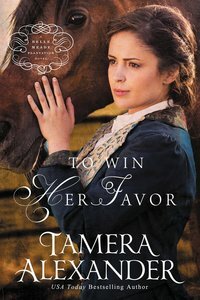 About "To Win Her Favor (A Belle Meade Plantation Series)"
Customer Reviews For "To Win Her Favor (A Belle Meade Plantation Series)"
Tamera is a wonderful writer and has once again painted with words a story worth reading. I just love the intensity of this story and how she delicately weaves a bit of intimacy into the story-line. The Author has created a novel with a good balance of family relationships, romance, friendships and faith; which makes for a very compelling and captivating story. that kept me interested from the beginning until the end of this novel. This book can be read as a standalone novel, however, I read Book 1 in this series, To Whisper her name, which gave me an understanding of the characters and story-line from Book 1 that the the Author sometimes refers to in this novel. Well worth reading. Order now to secure your copy when our stock arrives. Other edition is available. 9780310291084 0 Available. Expected to ship in 6 to 7 weeks from Australia.